Welcome to Old Brewery Antiques. You are now under the antique furniture page. Old Brewery Antiques offers thousands of antique furniture in this page. This furniture vary from tables, chairs, armoires and wardrobes, cabinets, cupboards, dressers and vanities, desks, sideboards, buffets, and a lot more. While most of these antique furniture are made out of wood such as oak and mahogany, some of them are also made from silverworks, metals, and stainless – mostly those from the mid century and those that are reproductions. Yes, the antique furniture available here can be either the original ones, or reproductions, so be sure to read every detail of the product to know what you are purchasing is actually suited to your liking (that is, if you really prefer an original antique, or a reproduction is fine with you). Anyway, these reproductions are carefully created based on the original designs and materials of the specific item on a particular era it existed. Not only they are of great quality also, most of them are cheaper too compared to the originals. 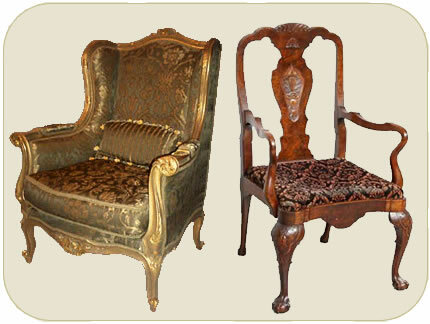 These antique furnitures can be of different styles. Some of them can be a mid-century modern, the very primitive ones, art deco, rustic, traditional and others. These items may also be originated from all over the globe such as America, France, Italy, Asia, England, etc. Moreover, these antiques may have been existed as early as the 1800’s, up to the post-1950’s. Old Brewery Antiques gives you a lot of selections based to your liking; just take your time and look around and see if there’s something that will be interesting to you.